In this INDRP matter, the Complainant Company was incorporated as Acko General insurance Limited in Sept 2006, while it’s holding company was located in US. The Trademark in respect of ‘Acko’, ‘Acko Technology & Services Pvt Ltd’, etc were pending in India. Further, the Complainant also owned domain names such as Acko.in and Acko.com. The Complainant claimed that mark ACKO is distinctive, unique and an invented mark derived from the word ‘ECHO’ as the Complainant operates with the philosophy to resonate or echo the customer’s requirements and fulfill them. A mere mention of the said name/mark establishes the identity and connection with the Complainant and Acko General Insurance Limited. And as soon as Complainant discovered the Registration of the Domain Name by the Respondent, he called him up, where in response the Respondent demanded USD 30,000,which was followed by email communication as well. the Registrant’s domain name has been registered or is being used in bad faith. Whereas, the Respondent contended that he registered the domain name in October 2016 almost 6 months after registration of Domain Name “ACKO.IN”. The IRDA registration and media recognition, the company received was in 2017, as on record. Further, the Trademarks of the Complainant were unregistered. Also Respondent denied of having demanded any money over the telephone but submitted as was having future business plans and that the email he sent was under pressure due to the Complainant demand for the domain name, time and again. Furthermore, Complainant and Respondent were involved in a UDRP battle as well regarding AckoInsurance.com as well. While the INDRP proceedings were pending, the Complainant received UDRP order in his favor, that was updated to the Arbitrator, while the matter was pending the INDRP award. The NIXI Arbitrator held that Honorable Supreme Court has recognized Domain Name as part of Intellectual Property and is a Business identifier. Domain Name in as much helps distinguish specific businesses or services of different companies. The Disputed Domain Name consists of “Acko” followed by the general term “Insurance”, in fact if a generic word is connected to the business of the Complainant, the chances of confusingly similarity increase even more as any consumer would expect the Complainant to use it’s trade mark or trade name in conjunction with the terms which identifies its area of business. Therefore, it was held to be confusingly similar to the trade name/ mark of the Complainant. 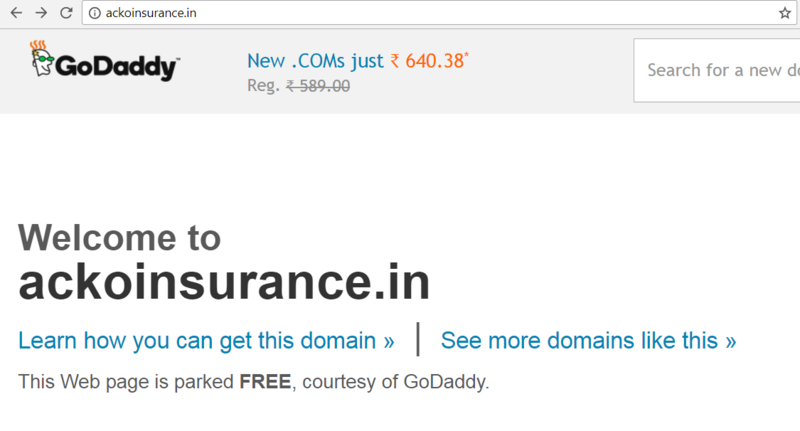 The Respondent was not making any legitimate use of the Domain Name, while the Complainant having obtained registration from the IRDA (Insurance Regulatory and Development Authority), while the Respondent did not had any such approval which could have helped the use of word ‘Insurance’ in the Disputed Domain. While the Respondent failed to adduce any evidence in respect of any legitimate business being carried on, though claimed that in near future they plan to approach IRDA for necessary approvals. But the legitimate business principle takes in view the preparations already made or legitimate use being made by the Domain Holder as on the date the knowledge of the domain dispute comes to the knowledge of the Respondent, either as a result of any notice served upon by the Complainant or either a notice received from the Registry as to a Domain Name Dispute having been filed. In a 2016 INDRP matter of HuntNews.in, the Respondent even tried to make changes to the Website to prove legitimate interest but that was taken note in the Arbitration decision and penalty was imposed upon the Respondent ! Lastly, Bad Faith was visible in the demand of USD 30,000 being made from the Complainant by the Respondent in an email communication and also Complainant claimed that respondent domain name misrepresents public at large that the Respondent has some relations with the Complainant or have any authorization which is not so. Therefore, the Arbitrator held that all the three conditions under the domain dispute policy to have been satisfied and ordered for the transfer of the domain name.